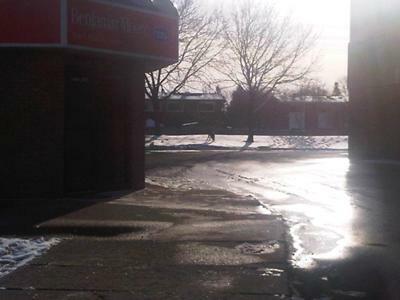 Burlington Coyote - Just saw a Coyote today January 22, 2012, at Appleby and Upper Middle, walking through the plaza (McDonald's) at 9:30am!! I couldn't believe it and followed it behind the plaza where there is a path. I managed to get two pictures, as did another man walking his dog. Here is another report from one of our readers ... Recently I saw two Coyotes in Burlington near the houses in the Tyandaga neighborhood they were actually running around the parking lot of the variety store there. These houses do back on to ravines but is this common? These are walking grounds for the neighborhood dogs it was early to around 10:30 or so, I would hate for one of the dogs to get attacked. I just couldn't believe they were just in the neighborhood like it was no big deal! Cameron Scholesfrom Burlington also wrote to us ... March 21, 2012, a Coyote was observed by our neighbour in a very residential area in downtown Burlington, near Brant and Fairview. The Coyote was scouting, hunting, doing what they do at dawn. Their first appearance in our immediate area is a major concern, as there are a number of folks in our neighbourhood - including myself - who have cats, that because of their breed (Norwegian Forest Cat), cannot solely reside indoors and need to be let out. And their "runnies time" coincides with the Coyote's; dawn and night. Barbe also wrote from Burlington ... The first time we saw the Coyote was the afternoon on January 1st this year, he was strolling down the middle of our street. Since that day while walking our senior black Labrador, we always carry a heavy walking stick. Today, January 13th, again early afternoon he was strolling down the middle of our street. Neighbours began to call as we had been telling people with pets and small kids to be aware. Someone called the Humane Society and we saw the van go by with the Coyote trotting in front of it. Minutes ago two police cars came down the road the Coyote went up on the boulevard in front of our home. The police tried to box it in with their cars and it took off with them pulling 180's in hot pursuit !!! So much for co-existing. Thanks for your submissions to our site!